During a PLN twitter #satchat[i] session on a Saturday morning, Charity Stephens[ii], a teacher, shared her use of Tagboard.com with her students. The students studied grammar—different elements of pronoun usage. When Charity introduced hashtags to support the work, one of her students introduced the idea of Tagboard.com. Like any excellent teacher, Charity naturally welcomed the student’s idea and incorporated it into the lesson. Working in teams, the students posted their ongoing work products on a classroom tagboard, so that all of the teams could compare their answers, formatively assess their work and that of the other teams. The lesson and using tagboard enabled students to support each other in making sense of the work, rather than a traditional approach where students would complete their individual work and await the teacher to tell them what’s correct and what’s wrong. This lesson experience by Charity and her students exemplified engaged student voice, where the students did the major work, while the teacher could facilitate and coach students where needed. Tagboard[iii] is a website where you can capture any conversation that includes a specific hashtag. It captures content from 6 different social networks, which offers flexibility from where users who share the same hashtag can participate in the learning dialog.ilitate and coach students where needed. For example, I could create #jmcEng1 for students in a first hour English class to use for dialog and resource sharing about concepts and content. Or I could use the same hashtag for students in all sections of 1st year high school English—thus breaking down the artificial barriers for collaborative learning dialog between all students studying the same work. I also find it’s use valuable when teaching college course and online courses. Using a common hashtag like #edu5410, the ongoing conversation and level of participation can be tracked and analyzed. Students have an easy way for instant asynchronous conversation via their phones and tablets. Later, they can check tagboard for a balcony view of the conversation for their own reflection regarding active collaboration and ideas to dig into for more dialog. From the K-12 students, college students, and their respective Education staffs, hashtags and social networks are mediums for active and deep conversations around learning, reflection on practice, and related resources. Tagboard is means to capture such active voices in an easy format for analysis, reflection, response, and collaboration. 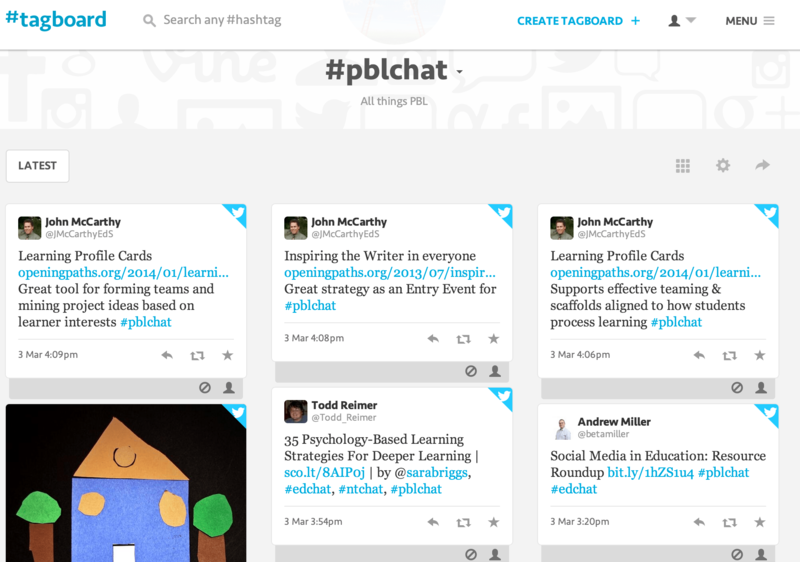 Would love to read your comments about using Tagboard with students and/or staff. [i] #satchat is a PLN of educators who dialog about educational topics and issues to improve understanding and explore different perspectives. Meets on Saturdays at 7:30 a.m. est. #nbtchat is another PLN that meets on Sundays at 8:00 p.m. est. [iii] Tagboard offers free and paid accounts. I’ve only used the free version. Refresh rates may vary. I tend to do manual refreshes, which seems to work after about a minute on posting comments with a hashtag.